The Corporate Startup won the Golden Axiom Business Book Award 2019 in the category Business Theory. In 2018 the book won the CMI Management Book of the Year Award, category Innovation and Entrepreneurship. • The Corporate Startup provides frameworks, visualizations, templates, tools and methods that can be easily applied to develop new products and business models. ‘Big companies need to innovate or die. The question is how. Companies need a playbook; a process by which they can start the process of transforming their organizations into innovation engines. The Corporate Startup is that playbook. It provides a proven methodology—applying Lean Startup principles and more–for building a culture of innovation.’ — Ben Yoskovitz, Co-Author of Lean Analytics and Founding Partner @ Highline BETA. ‘We have found The Corporate Startup model and the thoughts on the innovation ecosystem very useful in designing our innovation strategy. This book is a must read for all corporate leaders that want to transform their companies to be more innovative.’ — Erik Kongsvik-Ibsen, Vice President of Strategy and Business Development, Egmont. 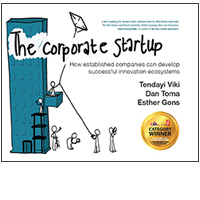 The Corporate Startup is also published in Dutch: De Corporate Start-up. Tendayi Viki is the founder and principal consultant at Benneli Jacobs, a strategy and innovation consultancy firm that helps companies develop internal ecosystems so they can innovate like startups. He holds a PhD in Psychology and an MBA. He has worked as a consultant, speaker and trainer for several companies including Airbus, Amdocs, American Express, The British Museum, General Electric, Josera, Pearson, Pets International, Standard Bank, Tetrapak, Whirlpool and The World Bank. He is also a Contributor at Forbes Magazine. Dr Viki co-designed and helped implement Pearson’s Product Lifecycle, which is an innovation framework that won Best Innovation Program 2015 at the Corporate Entrepreneur Awards in New York. Thinkers50 has nominated Tendayi Viki in 2017 for the Innovation Award and is on the 2018 Radars list. Dan Toma comes from an entrepreneurial background. He has been involved with Hi-Tech and internet startups across the world and is an entrepreneurship community leader in Europe. In recent years, he started focusing more on enterprise innovation management, specifically on the changes large organizations need to make to allow for disruptive new ventures to be built in a corporate setting. He has worked with companies like Deutsche Telekom, Bosch, Jaguar Land Rover and Allianz. A big proponent of the ecosystem approach to innovation, Dan has also worked with various government bodies in Asia and Europe, helping developing national innovation ecosystems and implement national innovation strategies. The work experience gathered from the public and private sector has been translated into various experiential courses that Dan has delivered for universities worldwide. Esther Gons is co-founder and investor of NEXT.amsterdam, helping startups from ideas phase to a working business model. She has developed the entrepreneurship course for the Communication Multimedia and Design program at the Amsterdam University of Applied Sciences. She is also an international speaker who organized the first StartupBus Europe tour in 2011 and has acted as lead mentor at Rockstart Accelerator for the past 6 years. As a visual spatial thinker she was part of bringing the lean startup movement to the Netherlands. Esther has mentored over 100 startups so far and still acts as advisor for many of them. Connecting corporates to the startup ecosystem is important to NEXT, so Esther is also frequently involved in corporate innovation.